Nothing says summer is here more than evenings outside enjoying the warmth and breezes with family and friends. 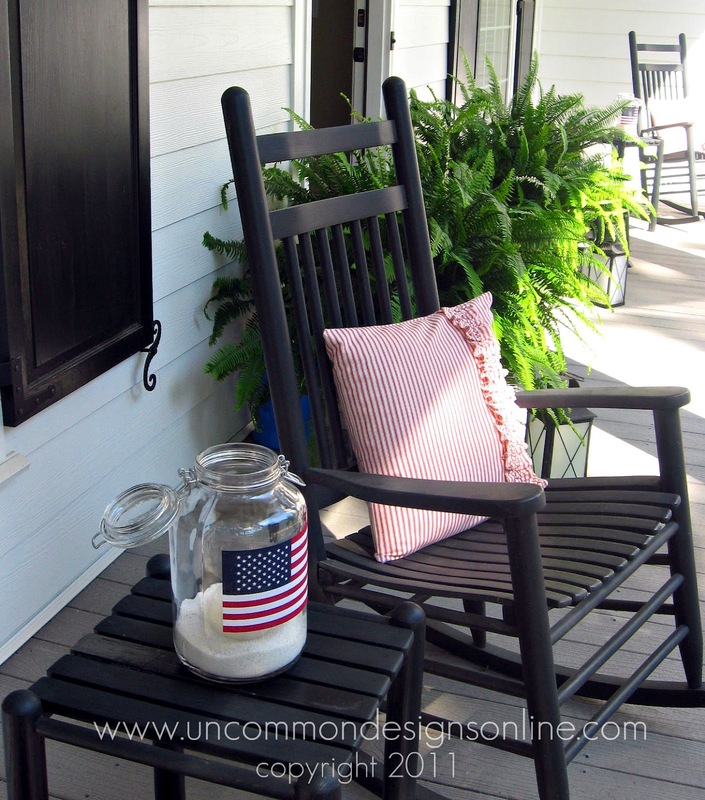 For your Fourth of July celebrations, these adorable and simple American Flag Mason Jar Lanterns are a perfect way to add a subtle glow and patriotic touch to your porch and party. I made these quite a few years ago and they are still one of my most favorite projects. They are perfect for a unique accent for my porch side tables and add a touch of light. I did not want a traditional centerpiece or plant, and with the rustic look I was going for….this hurricane jar hit the spot! I found the tutorial at Sweet Something Designs and could not be more thrilled with the results! I snatched up the American Flags in the dollar spot at Target. You can also find American Flags on Amazon. I did not have any jars around my house, so I found this extra large mason jar at my local TJ Maxx. The traditional, old-fashioned design of it was just what I was looking for. You could also use extra large pickle jars or this 4 liter Canning Jar from Amazon. I applied the flag to the mason jar with Outdoor Mod Podge and allowed it to dry fully. I gave another quick coat of the outdoor mod podge on top of the entire American flag to seal it, allowing it to dry thoroughly. My children and I could not wait ’til dusk, so that we could light the candle and see the flag glow! 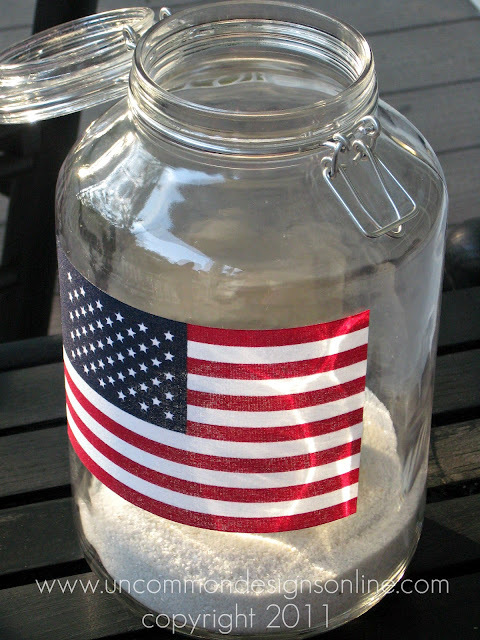 I simply poured a bit of clean sand in the bottom of each mason jar and nestled a small pillar candle down in it. You could even use a Citronella Pillar Candle to help with bugs. I also added these Patriotic Porch Pillows and my Red Burlap Wreath to the decor! 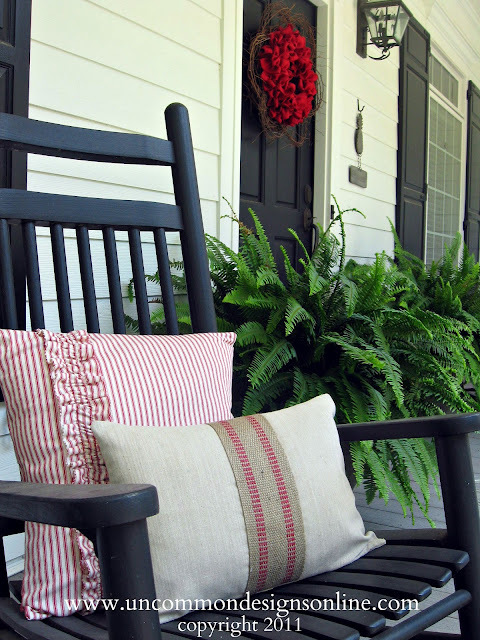 I completed the look of the porch with this adorable Burlap Flag Banner! The flag lantern, at night, all lit up is almost magical….and reminds all of our families about the importance of what the Fourth of July is about! Hey guys- just love all of your patriotic touches!! Hope you have a great 4th with the family. These are so cute!! 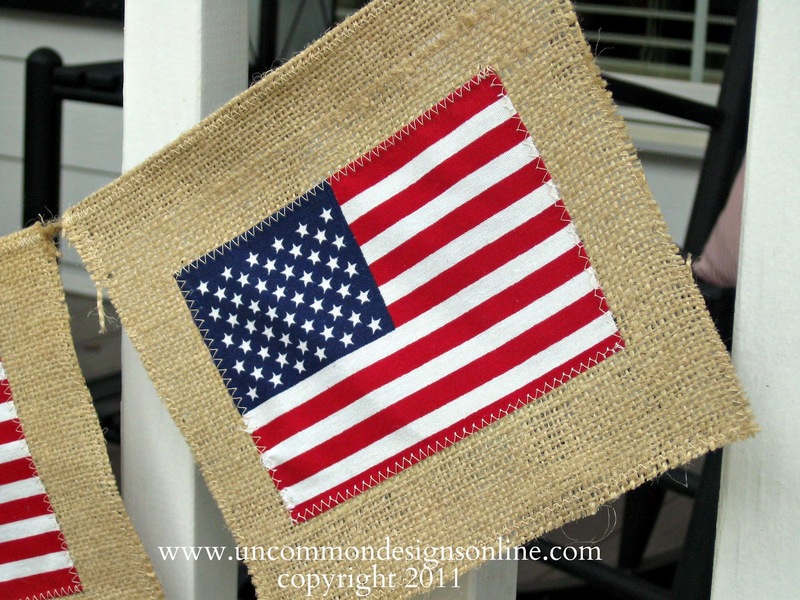 And I love the burlap flag banner as well!! Happy 4th ladies!! So cute!! I see you linked up to the pinning party, but something went wrong with your link, so I am here to tell you relink up…PARTY is live! Just wanted to let you know that I awarded you guys the Versatile Blogger award today! I love those flag lanterns! Very cute! Love the idea of the Mason Jar lanterns..with sand in them. 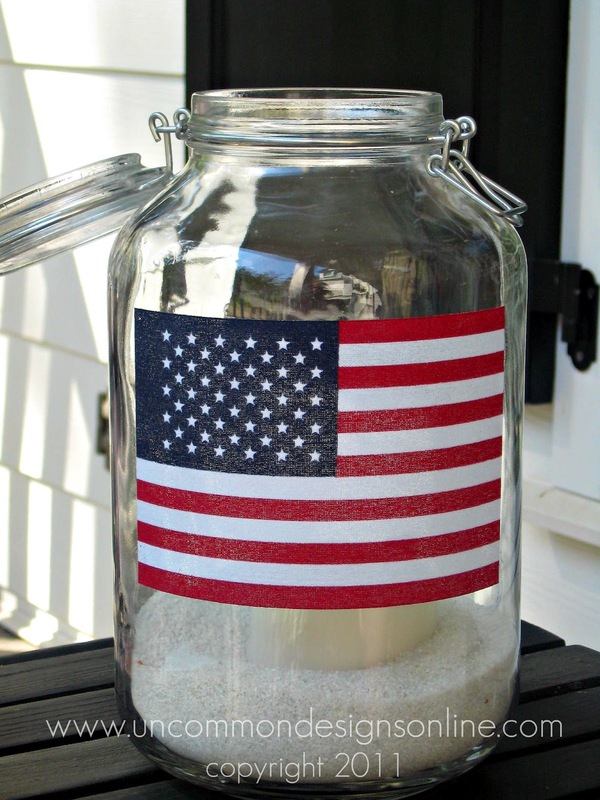 I think if I made these, I’d buy citronella candles to keep the mosquitos and other pesky bugs away..Is there a way to tint the sane, red/white/blue or add some other small decorative items to the sand.? What about spray painting some Shells patriotic colors and laying them on top of the sand. Would probably need a pr. of kitchen tongs to place the shells around in the sand, around the candle. Smell my saw dust brain working? I’m dropping by from the Whimsey Wednesday link party.This idea is so cute — and looks so easy! I think I could easily whip a couple of these out before the 4th! I am decorating for 4th of July today…. thanks for the great idea!! 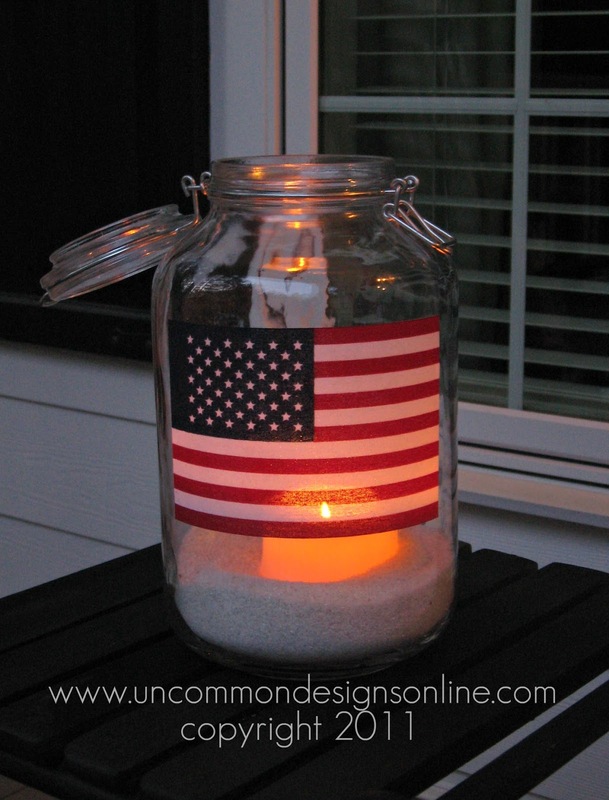 What a fun & easy idea for outdoor lanterns, especially for summertime! Thanks for linking up with Merry Monday this week – I pinned and tweeted your project.